Bhante Ratana was born in Sri Lanka and came to the U.S. in 2006. Bhante became a Buddhist monk in 1989 at the age of 11 years old. His monastic training was under the tutelage of the most venerable Malagamma Chandajothi Maha Thero at Sri Bodhirajaramaya in Kandy, Sri Lanka. Bhante Ratana holds a bachelor's degree with first class honors in Sanskrit from the University of Peradeniya, Sri Lanka and a master's degree in Pāli and Buddhist Philosophy from the University of Kalaniya in Sri Lanka. Bhante earned his Ph.D. in Sanskrit from the Oklahoma City University and Andrahpradesh University, India in a joint research program. After completing his studies Bhante was a Sanskrit Lecturer in the Department of Classical Language at the University of Peradeniya. 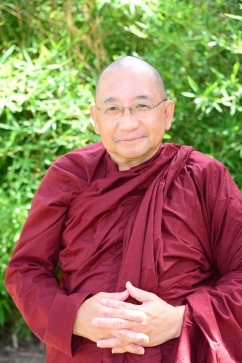 Currently Bhante is the senior teacher and leader of the Kansas Meditation Center. With 25 years of experience as a monk, Bhante guides the community in the Noble Practices left to us by the Buddha, sharing as much with the community as they are interested to learn. Bhante leads regular meditation classes throughout the week and is a Chaplain at the Oklahoma City Veterans Administration Medical Center (OKCVAMC) and volunteers at hospitals in the Central Oklahoma Region and the Oklahoma City County Jail. 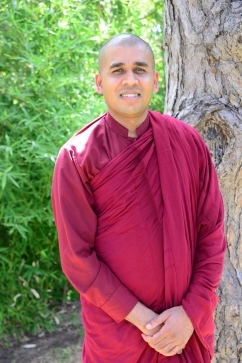 Bhante Rahula, born in Sri Lanka, came to the United States in 2017 to serve in the Kansas Meditation Center. 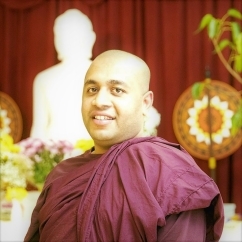 Bhante Rahula became a Buddhist monk in1992 at the age of 07 years old and received his higher ordination in 2005. His monastic training was under the tutelage of most Venerable Dr. Aluthwewa Soratha Nayaka Thero and Venarable Weththewe Pannarama Thero at Sri Sugatha subaddraramaya in Ganemulla, Sri Lanka. Bhante Rahula holds a bachelor’s degree in Philosophy from the University of Peradeniya, Sri Lanka. Before came to the United States, Bhante Rahula served in Thames Buddhist Vihara in Landon, United Kingdom and Eunjeoksa Buddhist Temple in Daegu, the Republic of South Korea. Currently, Bhante Rahula serves the community of Kansas meditation Center as Monk-in-residence taking an active role in all temple activities. Born in Hawaii, Bhante Piyananda was exposed to Buddhism due to the large Japanese presence there. He moved to California and later Chicago and Houston for a college education. In 2010, Bhante Piyananda retired in good standing as a Registered Addiction Specialist. His career spanned two decades with training in Welfare Law; clinical specializations in Adult HIV/AIDS Care; linkage case management with jail discharge planners; and crisis intervention services with those whose lives were impacted by persistent co-occurring disorders. He entered monastic training in 2011 and was ordained as a novice monk in 2013 under his preceptor Bhante Piyaratana Thero. Previous Theology and Comparative Religion training assisted with his transition to Buddhist monastic life. He holds an M.Div. from an interprovincial seminary and a B.Sc. in Biology, emphasis in allied health promotion. He attained his CADC in 1997, his NCRS in 2001 and his RAS in 2001. Bhante Piyananda assists Bhante Piyaratana in co-facilitation of a morning meditation class offered as complimentary therapy at OKC VAMC. His current studies are centered on Pāli language, Theravāda Buddhist studies, and Monastic Rules of the Vināya.